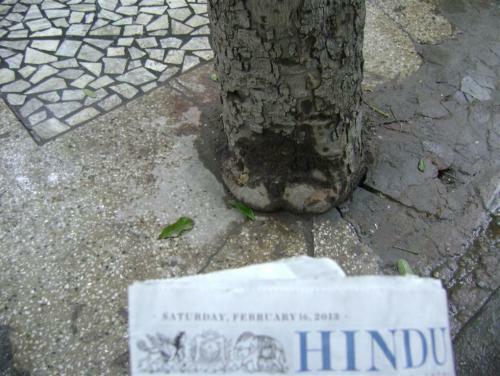 The concretisation of trees in Delhi is rampant amidst the ad hoc urbanisation taking place in the city. The concretisation is proving to be an imminent threat to the survivability of the heritage trees in Delhi and is leading to their choking and consequent death. This is despite the fact that existing policies and laws do not allow such concretisation and choking of the trees to take place. However, as is true for many other cases, the sighting of large number of concretised trees in Delhi indicates that the law is not being implemented. Fortunately, on 18.10.2010, the Government of India set up the National Green Tribunal (NGT) under the National Green Tribunal Act, 2010. The setting up of the NGT has been the most significant milestone as it is set out to play a critical role for the effective and expeditious disposal of cases relating to environmental protection and conservation in India. Now, a coalition of concerned citizens and activists been moved (Legal Petition No. 82/2013, Click to Download) the NGT to ensure the implementation of the laws and policies leading to preventing the concretisation of the trees in Delhi and immediate deconcretisation of concretised trees which are presently being choked to death. These trees have provided us shade, given us clean air, have been home to the large number and diversity of Delhi birds that some of us love to click, given us rain, augmented our ground water resource and what not. It is time now that we standby these trees and urge the NGT to pass a strong order to the different agencies who are responsible for immediate deconcretisation and preventing any further concretisation of the trees in Delhi. The next hearing of the deconcretisation of trees case in the NGT is on the 23rd of April, 2013, a day after the 22nd April – the EARTH DAY. We need to let the NGT know that are are enough people supporting the cause of saving the trees in Delhi and need your help. We are collecting at least 3,000 signatures and request you to kindly sign the petition below for protecting all the trees in Delhi. The petition is being hosted on an online green petitioning website greenthechange.com created especially for inviting people’s participation in saving ‘our common environment’. All the signatures will be collected and submitted to the National Green Tribunal on the day of the hearing of the aforementioned case.